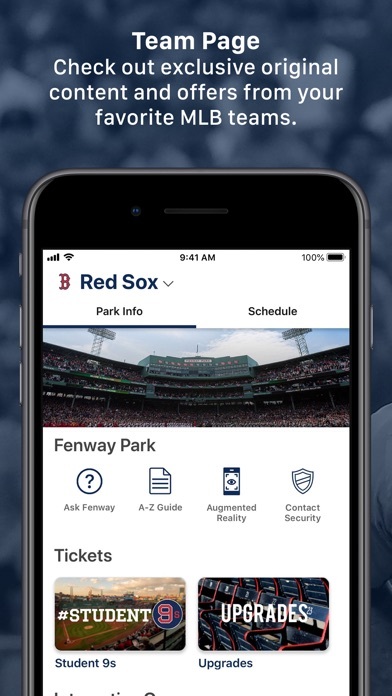 The MLB Ballpark app is your mobile companion when visiting your favorite Major League Baseball ballparks. 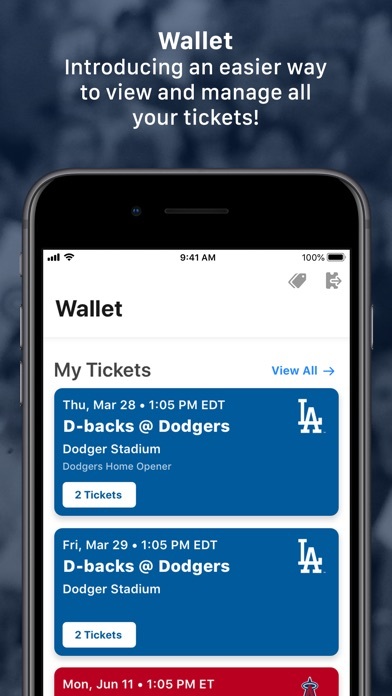 The official MLB Ballpark application perfectly complements and personalizes your trip with digital ticketing functionality, mobile check-in, offers, rewards and exclusive content. **** Ballpark Features (iPhone) **** • Access and manage your tickets (MLB account required; select clubs) • Team schedule, ticket information and sales and promotional event listings • Interactive map with directory of food, beverage, merchandise and other amenities • Check-in for offers and rewards, unlocked through your Wallet • View scores and photos from all your ballpark visits • Customize to feature a designated favorite MLB team • Social media clubhouse, including social rewards for select clubs • Seat and experience upgrade functionality (at select ballparks)* • Directions and parking information *Seat and experience upgrades: Angel Stadium (Anaheim), Chase Field (Arizona), SunTrust Park (Atlanta), Oriole Park @ Camden Yards (Baltimore), Fenway Park (Boston), Wrigley Field (Chicago), Guaranteed Rate Field (Chicago), Great American Ball Park (Cincinnati), Coors Field (Colorado), Comerica Park (Detroit), Minute Maid Park (Houston), Kauffman Stadium (Kansas City), Marlins Park (Miami), Miller Park (Milwaukee), Target Field (Minneapolis), Citi Field (New York), Oakland Coliseum (Oakland), Citizens Bank Park (Philadelphia), PNC Park (Pittsburgh), Petco Park (San Diego), Oracle Park (San Francisco), T-Mobile Park (Seattle), Tropicana Field (Tampa Bay) and Globe Life Park (Texas). Additional ballparks will be added as they become available. © 2018 MLB Advanced Media, L.P. All Major League Baseball trademarks and copyrights used herein are the property of the applicable MLB entity. All rights reserved. Avoid this app if you have any choice. MLB has a driving away fans with this sort of garbage. It's been saying a work in progress forever now. All our info appears to be lost. Trash. Boy, this app is bad. 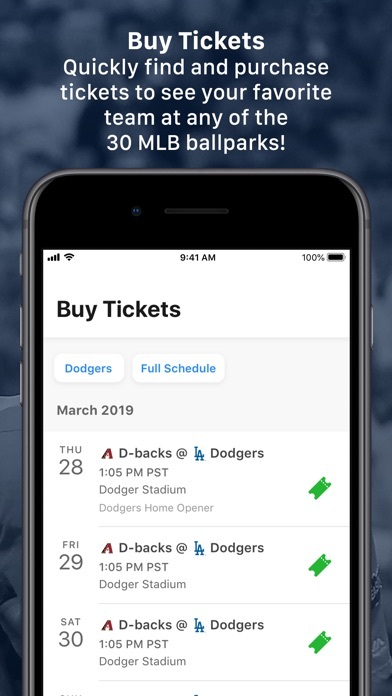 It’s like they had a bad app, fired all of their developers, and hired washed up baseball players, and hired them to make an even worse app. Basically, not even useful for the ONE thing I want to use it for - checking in and keeping track of games I go to - much less anything that would also be useful. 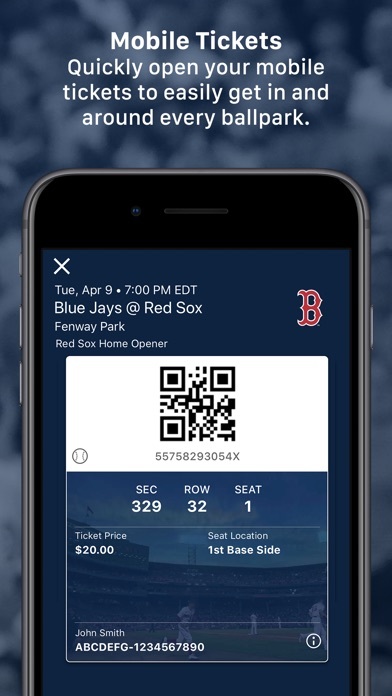 I used to use this app at every ballgame I attended (season ticket holder). Now it’s just frustrating. Can’t check in because the check-in system stays behind the iPhone keyboard and you can’t get past the section #. Doesn’t always remember my MLB login and I have to re-enter each time. Usability seems to have been forgotten this year. 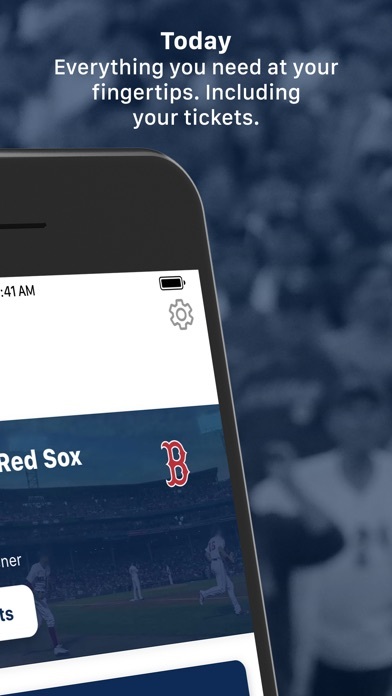 Did MLB just outsource all of their app development?! 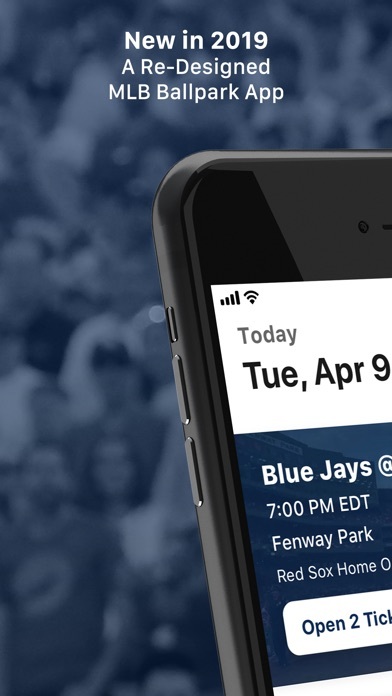 Don’t know why but this app almost ruined my experience at the ballpark. First off, it did not take my existing MLB password. So it made me change it, which I did. However after I was routed to mlb to change the password and went back into the Ballpark app to log in, it still said it didn’t take it. So I try to call customer service but they don’t open until noon. However, my game is at 1:10pm! It also takes me an hour to get to the stadium. Anyway, I keep changing my password but finally I just try the temporary password it auto generates every time you reset it and it worked. Barely made it to game and took 3 hours of my life. Terrible app and I have a sneaking suspicion MLB is going to a subpar development company for this app and their At-bat app. FIX THIS APP! I can’t acces tickets I bought for the game I’m going to and it made me renter information a dozen times, but would say that it was invalid because it was already in file, kick me out, then make me start over again. This is a mess. Is their “Work in progress” banner just to deter everyone until it is forgotten how good the app used to be?